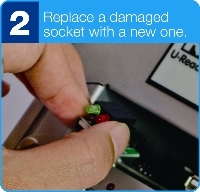 U-Reach Data Solutions Inc.: How do you make an instant replacement for a defective socket? How do you make an instant replacement for a defective socket? 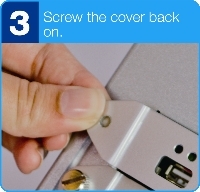 Since ease of maintenance isn't necessarily a design priority for most duplicators in the market, it can be very labor intensive and time consuming to replace a deteriorated socket - from opening the case, disconnecting cables, to removing boards, then reverse the whole process to complete the task. U-Reach uniquely designed its duplicators to facilitate effortless maintenance. 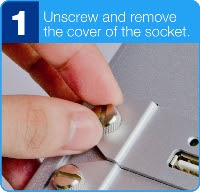 In its Intelligent 9 Duplicator users can easily exchange the sockets in THREE steps which can take less than ONE minute.